Measles: 2013 U.S. cases triple. 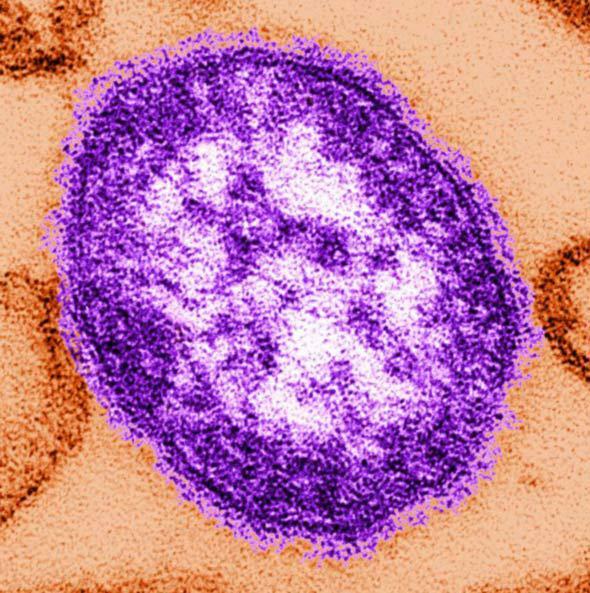 A measles virion (a single virus particle) seen via electron microscope. It’s long past time we wiped these things out. The Centers for Disease Control and Prevention just announced that measles cases in the United States in 2013 tripled over the annual average. There were 175 cases (so far), when usually there are about 60. Well, let’s see. In March, there were 58 cases alone in Brooklyn, N.Y., tied to a Jewish community that refused or delayed vaccinations. In Texas, a megachurch that preached anti-vaccination views had an outbreak with at least 20 cases. In North Carolina, 23 cases were reported in one outbreak; most of them in a religious (Hare Krishna) community that was largely unvaccinated. In all three of these outbreaks, someone who had not been vaccinated traveled overseas and brought the disease back with them, which then spread due to low vaccination rates in their communities. It’s unclear how much religious beliefs themselves were behind the outbreaks in Brooklyn and North Carolina; it may have been due to widespread secular anti-vax beliefs in those tight-knit groups. But either way, a large proportion of the people in those areas were unvaccinated. By the numbers, those outbreaks alone are responsible for the huge increase in measles cases in the U.S. this past year. And they are all due to people not getting vaccinated. Listen: Measles is not a disease we should be screwing around with. Thirty percent of cases develop complications like pneumonia, diarrhea, or ear infections. One in 5 children who contract it are hospitalized. One in 1,000 will get encephalitis. One or two out of 1,000 will die from it. Yes, die. From a disease that is essentially wholly preventable with a vaccine. Worldwide, measles kills more than 100,000 people every year. That’s 18 deaths per hour. Before the U.S. vaccination program started in 1963, 400 to 500 people died from measles every year here. Tens of thousands more were made very ill and were hospitalized. Today, that number has dropped to almost—but not quite—zero. And that’s because of vaccines. If you can, talk to your board-certified doctor and find out about what vaccines you need. Vaccines are not expensive, but even so, many places provide free vaccinations; the CDC has a page that lets you find locations of health centers near you. And please, don’t listen to the nonsense promulgated by the anti-vaxxers. Vaccines do not cause autism. Vaccines do not contain a dangerous amount of toxins. In reality, vaccines work. They really do. It’s been 50 years since the measles vaccine was approved for use in the U.S. The CDC recently honored Dr. Samuel Katz, who was largely responsible for its development. The vaccine is now used worldwide, and over that time, it has saved millions of lives. Millions. Hear, hear. In 1977 we wiped out smallpox. Measles? You’re next.